This historic building started out as a granary near Great Falls, Montana, over 75 years ago. Scheduled to be torn down for the lumber, Bob was able to buy it intact. He and our two boys (then 11 and 14) were able to take it apart in three pieces and move it up to East Glacier Park. Bob has carefully rebuilt and restored it. Some of the original materials were used to finish the Summit and Cowboy cabins. The vintage tin siding was removed and used as ceiling treatment in the cabins. The large rear doors and part of the bin walls were used as flooring, trim work, and the bed in the Cowboy Cabin. Most of the main floor is Bob's workshop where he is currently building a replica sheep herders camp wagon. The remaining portion of the main floor is the Cowboy Cabin. This cabin is our smallest, but still has a kitchen with a cooktop and a full fridge. The bath has a shower (not a tub/shower like the other cabins). The bedroom has a queen bed and the sleeping loft has a twin bed. Included are all the amenities as the other cabins, with the addition of pots, pans, and other cooking items. Because of its small size, it does not have a gas fireplace. 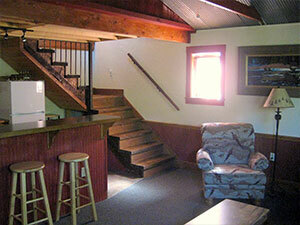 The Summit Suite is the upper two floors of the barn. Our biggest cabin, it has a separate entrance in the rear. Up a flight of steps, there is generous deck with table and chairs for relaxing. Step inside to the living room with fireplace, kitchen, and full bath. Up another short flight of stairs is the bedroom with a queen bed. This cabin also has cooking utensils and a full fridge. The Big Red Barn hosts a cabin and suite accommodations. Click on the unit name below to view availability and photos.